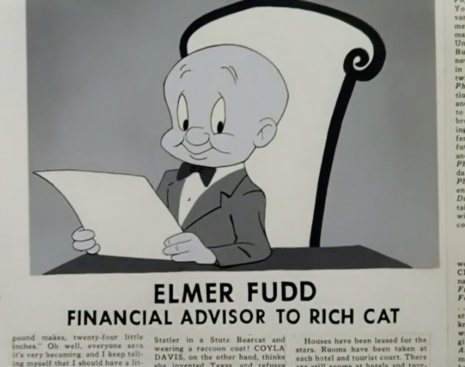 During what could be characterised as the height of the Red Scare in post-war America, fearful over the brittle state of the capitalist model—executives with General Motors commissioned a trio of propaganda cartoons from the creative cast behind Looney Tunes, which marked quite a departure from the usual antics and took a decidedly classroom tone to inculcate impressionable minds. It’s hard to say how seriously they took their assignment and perhaps only did so as to not draw undue attention to their studios. “By Word of Mouse” (1954) told the tale of a German country mouse, Hans, visiting an American city mouse cousin who lived in a fashionable department store called “Stacy’s” and mostly features Hans being dazzled by the abundance and selection of inventory available to the common worker, with a professor mouse explaining that free market competition of “Rival Department Store” drives prices down to the benefit of both producers and consumers. “Heir Conditioning” (1955) features Elmer Fudd acting as a financial advisor to Sylvester the Cat after inheriting a large sum of money, encouraging him to invest it rather than sharing it with his fellow alley cats. Learn more and watch all the cartoons on Dangerous Minds at the link above.